"Mango Girl" was an attractive young woman who had volunteered as a kindergarten teacher in a remote village on tropical Hainan Island. And when a 29-year-old white-collar worker in Shanghai got a message from her on WeChat one night in December, asking him to add her as a contact, he didn't think twice. That's according to a report in Thepaper.cn on Tuesday. It said the man, whose name was not given, told police he soon became smitten with the pretty, kind-hearted woman he was chatting to on the popular Chinese social network. 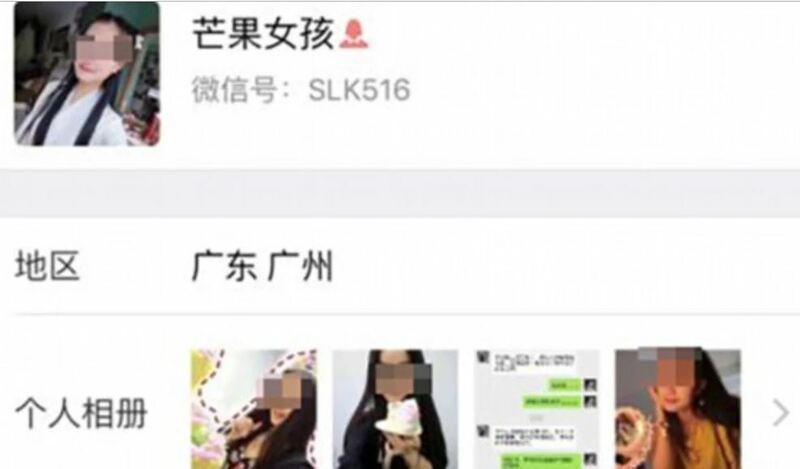 Only she wasn't a young woman at all - she was one of a number of fake profiles created using stolen photos and details from characters in web novels, according to police in the city's Pudong New Area. The WeChat profile for “Mango Girl” claimed she had volunteered as a kindergarten teacher in a remote village on Hainan Island. The gang behind the scam used the profiles to convince men to hand over more than 500,000 yuan (S$100,344) in just three months, from October to December, the report said, citing police. The white-collar worker who fell for Mango Girl told police he had been duped out of 13,000 yuan, which he sent in a series of cash gifts via WeChat after she told him her birthday was coming up and persuaded him to send something. But soon after he transferred the money, he found his "virtual girlfriend" had blocked him. The man went to the authorities, and after an investigation police raided an office in Changsha, Hunan province early last month, according to the report. That led to the arrests of 28 people - most of them men - in Pudong, who are accused of being part of a gang that set up fraudulent profiles on WeChat with the aim of persuading men to send them money, the report said. The leader of the gang, surnamed Yan, was one of those arrested. Two of the WeChat accounts had amassed more than 600 contacts each by the time police raided the office on January 5. In another case reported by Thepaper.cn, a "dance teacher" in Guangzhou who spent time doing charity work contacted a man, surnamed Wu, to be her WeChat friend. Her posts included photos of impoverished children living in remote mountainous areas she claimed to be helping. "Not long after I added her as a friend, she said she would go to see some poor children in Yunnan and wanted to buy them schoolbags and shoes," Wu told the news website. "She asked me if I wanted to donate, so I sent her 300 yuan," he said, adding that a friend later told him he had also given 500 yuan to the same account on WeChat.